The Gaylord Distributor™ is a cutting-edge Utility Distribution System (UDS) that's superior to a contractor-built wall—in every way. Designed for today's modern kitchen with the operator’s needs in mind, the Distributor provides every required service—electrical, gas, hot and cold water, steam, condensate return, compressed air and chilled water—to the cooking equipment, all in an attractive, pre-engineered unit. Available in a variety of configurations including island, wall-mounted and ceiling, the Distributor delivers the ultimate in flexibility, expandability, safety, cleanliness and convenience. 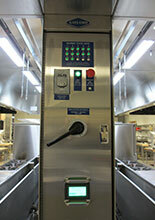 Optional equipment includes plumbing fixtures, pot fillers and security packages.